For more than 100 years, youth across America have been learning leadership, citizenship and life skills thanks to the help of volunteers and the 4-H program. In Florida 4-H is a youth development program of the University of Florida/IFAS extension where youth ages 5 to 18 “learn by doing” in a club setting. 4-H is not just for kids living on farms, it is for all youth no matter where they live farm, suburb or city. 4-H serves youth from all walks of life and interests. 4-H clubs are the foundation of the 4-H program. A club consists of 5 or more youth guided by at least one adult volunteer. Clubs can be a small group from a neighborhood or a large group with members from all over the county. Each club concentrates on one or more projects such as rabbits, cavies, citrus, swine, beef, poultry, etc. Members develop leadership by electing officers and conducting their meetings and encourage teamwork while working together on community service and fundraising projects all while making new friends and having lots of fun. What are the 4 H’s? The four leaf clover emblem with the “H” on each leaflet is easily recognized, but do you know what the four H’s represent? They stand for Head, Heart, Health and Hands the four elements of the 4-H pledge. They 4-H pledge is recited along with the Pledge of Allegiance at club meetings and other 4-H events. 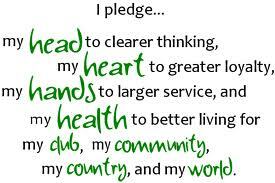 In addition to the pledge 4-H also uses the motto “To Make the Best Better” and the slogan “Learn by Doing”. This site also has lots of information on 4-H history.